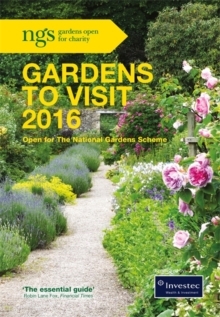 Published annually in spring and previously known as The Yellow Book, NGS Gardens to Visit 2016 lists nearly 4,000 gardens open for visiting. It is packed with full-colour photographs and informed comment. Fully updated and supported by an online database, NGS Gardens to Visit 2016 is now easier to use than ever. Look out for sensory gardens, those offering accommodation and delicious treats, and learn how to create your own patch. Find a garden to visit near you and support the NGS’s vital charity work.